We are surprising our friend Jon for his 40th and all he wants to do is see you. So excited that you will be there the weekend we are visiting. Will keep an eye out so we can get tickets and hopefully get front row. 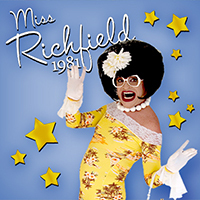 Miss Richfield, the schedule for your Provincetown shows only goes to September 3. Do you have a show on September 8 ? Oops! Didn’t get to this on time. I had a show the 7th, then on the 14&15. Then home!! So fabulous to have your wonderful family attend the show! Was a wonderful evening! !